I take a sip of my Nicaraguan coffee, the best I've ever had and the cheapest, only $3.50 a pound, grown not too far away. I sit on my patio, with a smile on my face, happier than I've ever been...and realize that I live this dream every day! Back home in San Diego, I never dreamed that I could afford to own something with an ocean view. I'm just a middle-class gal. There you can pay $1.5 million for something like that. 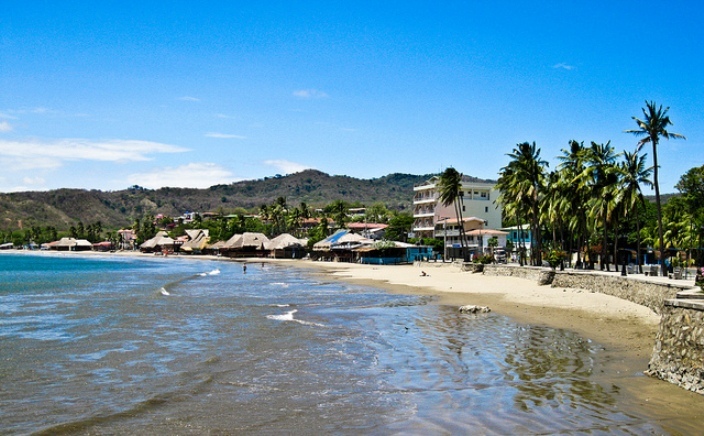 Yet here on Nicaragua's Pacific coast, I own a small two-bedroom/two-bathroom house, on an acre with an ocean view, which cost just $132,000. I pay real estate taxes of just $151 a year. And in my backyard, in addition to what I mentioned before, I also grow mangos, papayas, citrus trees, a cinnamon tree, and even moringa, the tree of life. My house is an eight-minute drive or a 20-minute walk from San Juan del Sur, a vibrant beach town with a big international expat community. If the mood takes me, I can go to El Timón restaurant for a fresh red snapper ($8) and the best mojito in town. Or to Bambú Beach restaurant for international fare like a chicken-curry rice bowl or a fish fillet with orange-chili sauce for the same price. Fish tacos for $1, veggie wraps for $5, a raw-food sandwich for $6, fresh-out-of-the-oven cinnamon buns, sushi...you can satisfy any craving here. I moved to Nicaragua in 2007. I got to retire young, 11 years before my planned retirement age of 65. But I didn't want to wait for the next phase of my life to begin; I wanted to make it happen. Divorced and living a nice life in San Diego at the time, I had my own successful technical-writing business, consulting for Fortune-100 companies. With interesting work and nights full of scheduled dinners, parties, and getaways with friends, I was living the proverbial American Dream. My two independent daughters lived in San Francisco; we talked all the time, and we saw each other about four times a year. Life was indeed grand. So what was wrong with this picture? I felt that life's big surprises were gone. Those in-your-face moments that you have in your 20s didn't happen anymore; everything was complacent, peaceful, predictable... I wanted to recapture that spirit of youthful adventure. And Nicaragua certainly is a place to feel young again. Every time my kids see me, they say, "Mom, did you do something? You look younger." My answer? "No, girls, I'm so happy in my new life that it shows." Of course, I was drawn by the good weather, too -- average temperatures are 85 F year-round -- and it is so cheap to live here. Monthly living costs, without rent, for a couple living comfortably are around $1,000. Many of my friends here rent furnished apartments or vacation homes at prices as low as $300 for a one-bedroom furnished apartment, with water, electricity, and WiFi included. My daughter Talia brought me to Nicaragua in 2006 for my birthday present. When I exited the plane and my foot hit the tarmac, I literally felt a shot of electricity course through my body. That two-week trip blew me away. Suddenly colors seemed brighter, the food more delicious; sunsets were spectacular in gold, purple, pink, blue, and orange; the water clear, the air fresh, the native people kind and friendly. I felt more alive. I had fallen in love -- not with a person, but with a country. It was all I could think about when I got home to California. I started researching and knew I had to go back. Six months later, I visited once again with a friend, and, on a whim, decided to move to San Juan del Sur within three months. I bought a house in a day, packed my life into a storage space back home, and never looked back. Today I write web content, do translations, and help people market their businesses. This supplemental income is all I need here to keep me going. Had I stayed in the States, the economic downturn would have cost me my job and my home. After I left San Diego, all my technical-writer friends lost their jobs. Many double-income families I know lost their homes and had to declare bankruptcy. The same would have happened to me. I got out just in time. Here I can stay forever without much money and lead a more interesting and varied lifestyle. All in all, my life is more fulfilling here than in the U.S. I always wanted to do volunteer work, and Nicaragua has an abundance of volunteer opportunities. Only about 10,000 people live in San Juan del Sur and the surrounding area, but in this tiny town we have plenty to keep us busy. The marimba is a popular instrument in Nicaragua and I'm taking lessons. Once a year I play with a big marimba band on the anniversary of Cultural Night at El Timón restaurant. They say I'm the first foreign female to ever play the marimba in Nicaragua! Lots of classes exist...so far I've taken Latin dance lessons, painting classes, yoga classes, and recently a belly-dancing class. I'll be the first in line when they start a Nicaraguan cooking class, which may be coming soon. Each of these classes costs me only $4.50 an hour. You can't beat the great exercise and the camaraderie. 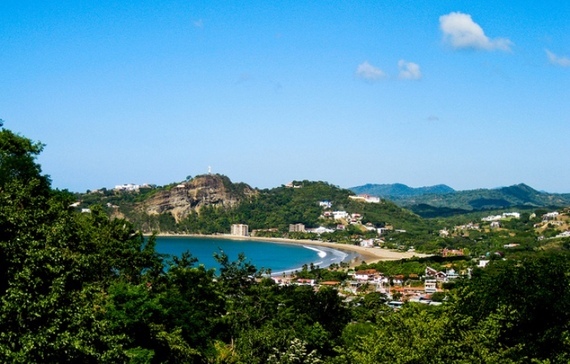 The 1,000 or so expats who live in San Juan del Sur make it easier for people who don't speak Spanish. However, the biggest selling point of Nicaragua has to be the Nicaraguans themselves. Warm, friendly, and always willing to help you, they are the real reason I felt comfortable enough to come down here by myself. And if I want a different experience any time, I hop on a bus for about $2.50 and go experience the colonial cities of León (four hours away) or Granada (1.5 hours away). Or I jump in my pickup truck and haul a bunch of people to one of the 21 gorgeous virgin beaches that surround San Juan del Sur. My kids often say, "Mom, you're busier than we are and you are retired!" It's true. And I'm loving every minute of it. Sunset from the hills above the town. Visit the Pelican Eyes Resort (the best hotel in town) for happy hour to take in this view. Photo courtesy Jason Holland, <a href="http://InternationalLiving.com" target="_hplink">InternationalLiving.com</a> .